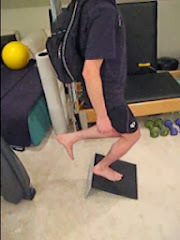 The Eccentric Exercise Protocol for Chronic Patellar Tendinopathy: Why do so few doctors and physical therapists know about the application of eccentric exercises to patellar tendinopathy? Why do so few doctors and physical therapists know about the application of eccentric exercises to patellar tendinopathy? Unfortunately, based on my own experience, I have found that very few physical therapists and medical doctors, including orthopedic surgeons, in the United States are aware of the application of eccentric exercise to treat patellar tendinopathy. -- Much of the research is relatively new. It has not yet made much headway into the curricula of the medical and physical therapy establishment. -- Virtually all of the research has been done outside the United States. The most prolific author of studies on eccentric exercise, Håkan Alfredson, is based in Sweden. -- Orthopedic surgeons, with whom many tendinopathy patients consult, are focused primarily on surgical procedures rather than teaching exercise techniques. -- There is little financial incentive for anyone to promote the use of eccentric exercise. It does not require expensive equipment. People can do the exercise in their home. -- Many physical therapists are simply bad at what they do and not as good as we hope them to be. -- There are few protocols describing how the exercise should be done. -- Because squats are contraindicated (i.e. not recommended) during the early inflammation phase of tendinopathy, as they can worsen symptoms, some "old school" physicians simply will never recommend squats. These doctors may incorrectly believe that a patient with the chronic manifestation of the condition has inflammation. "How could squats be good if they worsen the already existing inflammation?" they might ask. They continue to use the term "tendinitis" -- a word that connotes inflammation -- months and years after there are no signs or symptoms of inflammation in a patient. "New school" physicians, however, recognize that there is no inflammation in what is often diagnosed as chronic tendinitis. When there no longer is inflammation, eccentric squats can be beneficial for the condition. "Most currently practising general practitioners were taught, and many still believe, that patients who present with overuse tendinitis have a largely inflammatory condition." "Instead of adhering to the myths ... physicians should acknowledge that painful overuse tendon conditions have a non-inflammatory pathology. Light microscopy of patients operated on for tendon pain reveals collagen separation—thin, frayed, and fragile tendon fibrils, separated from each other lengthwise and disrupted in cross section. There is an apparent increase in tenocytes with myofibroblastic differentiation (tendon repair cells) and classic inflammatory cells are usually absent. This is tendinosis and it was first described 25 years ago, but this fundamental of musculoskeletal medicine has not yet replaced the tendinitis myth. Tendinosis is not merely a long term corollary of short term tendinitis. Animal studies show that within two to three weeks of tendon insult tendinosis is present and inflammatory cells are absent." "If general practitioners, orthopaedic surgeons, and other members of the healthcare professions treating tendon disorders made a quantum shift from previous flawed teaching about overuse tendinitis and adopted these data there would be immediate ramifications. Nomenclature for the clinical presentation of tendon disorders would reflect the true histopathological basis underlying clinical presentation. The term tendinitis would rarely cross doctors' lips. Numerous authorities recommend the term tendinopathy (for example, Achilles tendinopathy) as this acknowledges that the condition is not tendinitis. We favour this term for clinical diagnosis. " "If general practitioners treating musculoskeletal conditions embraced the tendinopathy paradigm, it would provide patients with an accurate description of their condition. It would avoid inappropriate pharmacotherapy with its attendant costs and comorbidity. Furthermore, by accepting need to allow time for collagen turnover and remodelling inherent in the pathology of tendinosis, doctors would be free to provide patients with a realistic prognosis that better reflects the finding of prospective clinical studies. These conditions take months rather than weeks to resolve."